I’m slowly getting back into the swing of things after our latest trip so here are a few real quick items to know. 1) $5 Free at iTunes for Virgin Atlantic Card Members – I got an email from Virgin Atlantic below offering me $5 off a $5+ purchase at iTunes if I paid with my Virgin Atlantic credit card. I’m unable to tell if this is for all Virgin Atlantic card members or whether it is targeted. I admit the email did look like spam at first so check your email inbox for an email with the subject “An iTunes® offer that’s music to your ears”. 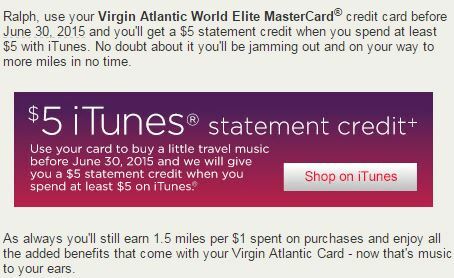 This is an easy and free $5 so check your email if you have a Virgin Atlantic credit card. 2) Increased Delta Credit Card Offers – American Express has increased the offers on the Delta Gold SkyMiles and Platinum Delta SkyMiles credits cards through June 30th. The Delta Gold card is offering 50,000 miles + $50 statement for spending $2,000 in 3 months with the annual fee of $95 waived for the first year. The Platinum SkyMiles card is offering 60,000 miles + $100 statement + 10,000 MQMs for spending $2,000 in 3 months with the annual fee of $195 NOT waived for the first year. The offers have also increased on the business version of these cards as well. While these offers are among the highest I’ve seen on the Delta cards, Delta miles are worth less than other airline miles. My most recent SkyMiles redemption? 20,000 miles one way for SEA to JFK as the flight was selling for over $300. Sure I got 1.5 cents in value but paying 20,000 miles one way for a domestic flight in economy left me feeling dirty. If you can’t tell, I’m not a huge fan of Delta right now. 3) 10% Cashback Card – Discover is having a promotion in which they are doubling their normal cash back percentages on the Discover IT card for a year. Since the card offers a rotating list of 5% cash back offers quarterly, this mean those quarterly promotions are now offering 10% cash back on purchases. Unfortunately that is limited to $1,500 in spending per quarter but that’s still $150 a quarter ($600 a year) in your pocket if you max it out. This offer is valid for both new and existing cardmembers. I would read this Doctor of Credit post for more details about the offer and how to get it. 4) American Express Premier Rewards Gold Changes Now In Effect – I’ve posted previously about some of the changes coming to the Premier Rewards Gold card and as of yesterday, those changes are now in effect. The biggest changes are a $20 increase in the annual fee to $195 but it now also offers a $100 airline credit, no foreign transaction fees and 2x points on US restaurants. 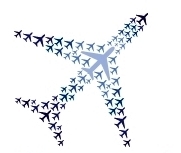 The airline credit should be similar to the airline credit offered on the Platinum card in that it is calendar year based so you can take advantage twice before having to pay another annual fee and buying gift cards for certain airlines should still work. I don’t think this card is worth keeping past the first year but I will look to add this card to my collection soon.